Park Forest Busoler is the youngest park forest in Istria County, where most of the trees were planted at the beginning of the 20th century. It covers an area of 22.5 hectares and has a circular walking trail equipped with educational panels and trim trail. The entire area is ideal for rest and recreation; there is exercise equipment for outdoor workout, children’s playground, as well as tables with benches as an ideal place to rest in healthy natural environment. Or have a picnic. Why not? 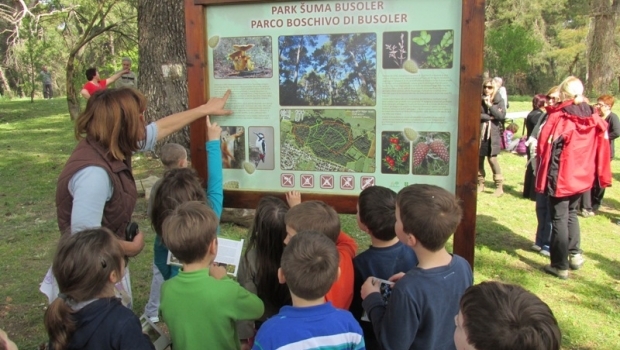 Park Forest Busoler was proclaimed a protected area in 1996 and was named after common boxwood (Buxus sempervirens) (Italian bosso comune, bossolo) which grows in the forest along with numerous pine species (Pinus brutia), (Pinus halepensis) and (Pinus nigra).